Valuebiz and Relocation Strategies are so honored to have been given the CBJ Women in Business Award. Responsibilities: Delaine Mead leads and manages two firms. Valuebiz is a direct-import, business-to-business furniture company. Relocation Strategies is a project-management business. Both are nationally certified Woman Business Enterprise companies with a combined 21 employees. Key accomplishments: Annual revenue for Valuebiz increased 27% in 2012. Relocation Strategies grew 40% due to several large contracts, including work for the Democratic National Convention in Charlotte. Mead was named the 2012 NAWBO-Charlotte Woman Business Owner of the Year, and she became president of the group the same year. How she got started: The native of upstate New York and the youngest of four sisters has a background in corporate finance. She married her high-school sweetheart, and when his job relocated the family to Charlotte in 1999, Mead began buying residential properties. She amassed a large portfolio and later bought commercial space. That led to tenants that needed office furniture. Mead bought Valuebiz in 2006 to serve that need, and two years later bought Relocation Strategies to manage corporate moves. Personal challenge: Mead has lived with rheumatoid arthritis all her life, creating constant pain and the need for ongoing surgeries. She has endured three hip replacements. As a young person, she grew tired of being told to limit her activities. There was something burning in my belly to prove to everyone that I could do it. I believe everyone has a cross to bear. You are here once, so you have got to make it a good ride. Congratulations to Delaine Mead, winner of NAWBO (National Association of Women Business Owners)2012 Woman business owner of the year award!! Delaine Mead has just named a finalist for NAWBO (National Association of Women Business Owners)2012 Woman business owner of the year award!! Valuebiz just named one of North Carolina’s Top 100 Small Businesses! Valuebiz earns national certification as a Women Business Enterprise. This insures our clients that we are woman owned and woman mangaged! 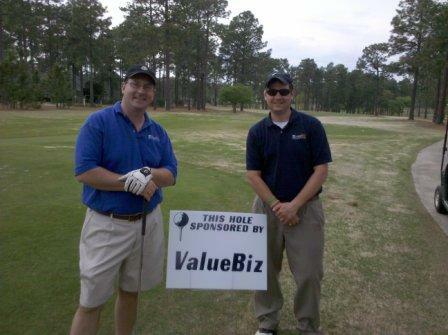 Valuebiz President/CoO, Mark Mead & National Sales Representative, Andrew Mead at National Golf Club in Pinehurst, NC for Wingate College’s President’s Cup. Benefits go to the athletic foundation to provide scholarship assistance to athletes. Wingate ranks 3rd in the NCAA Division II Academic All-American list with 34 honorees since 2000. Valuebiz has just become a Global Evolve dealer servicing Charlotte and the surrounding areas and nationwide. We are extremly excited to offer our clients a sustainable product with excellent design and performance. Evolve is designed to provide what you really want at an affordable price so they make a great match with Valuebiz. To find out more about Evolve and their amazing “green story” click on 360Â° thinking. 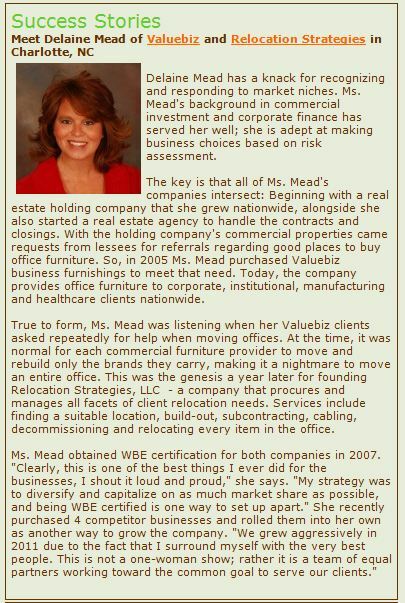 Valuebiz owner, Delaine Mead has been named a winner of Business Leader Media’s Top 50 Entrepreneurs of 2010. She will be honored at an award ceremony held on Monday, February 22, 2010. Her company profile will be included in the March issue of Business Leader magazine among all the Top 50 Entrepreneurs. It’s a true honor to be ranked among the other winners. 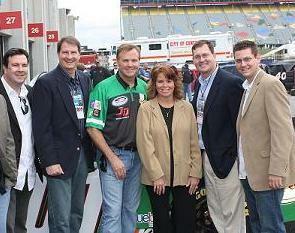 JD Motorsports has secured Valuebiz Business Furnishings as an associate sponsor for Charlotte. They are a local Charlotte Business that provides business furniture and furnishings. Mike Wallace’s in the #01 Chevrolet is happy to have Valuebiz as a partner in the local area for the Nationwide Series event. Delaine Mead, owner and CEO of Valuebiz wants the Charlotte-area race fans that might be in the market for business and office furnishings to consider Valuebiz for all their business furnishings. Call 704-522-1232 or visit their showrooms at 604 Pressley Road Charlotte, NC 28217. As businesses shut down and slim down, used-fixture dealers see green in their shelving. Valuebiz, a Charlotte store that sells new, used, and re-manufactured office furnishings, has added four employees in the last year, owner Delaine Mead said, and monthly sales are anywhere from even up to 30 percent. In the past, Valuebiz received its used office furniture from firms buying new items; now it’s because companies are laying people off or moving to smaller office buildings, Mead said. On a recent afternoon, the selection at its offices off South Tryon Street in Charlotte included a 10-foot-long, $1079 mahogany veneer conference table from a law firm, a $120 desk from a construction company and an array of workstations selling for about one-fourth of their original price. One was $525, down from $2,800. Some items were used for 18 months or less. Two real-estate agents from Asheville were browsing the showroom, and an insurance agent had just bought a set of new reception room furniture. Though the company typically works with mid-market small businesses, the recession has brought larger corporations that find themselves focusing larger on budgets. The economic climate has also just begun to bring in more fledgling entrepreneurs, who can find a home office setup similar to the one they may have used at a bank or law firm for under $1,000., Mead said.